How cool is corn? And how odd! Its succulent seeds, the kernels, come firmly attached to a unique holder, the cob, ideally suited for snacking at picnics. The cobs, in turn, are tightly wrapped in a multi-leaved husk, which shelters the kernels until they are ready to be eaten or detached and ground into ﬂour. Yet the same distinctive features which make corn attractive as a crop make it a dismal failure in the wild. The cobs and the husks prevent corn kernels from detaching and scattering in the wind or germinating on the ground. Maize (as this cereal grass is also known) needs us as much as we need it—it relies on human intervention to plant each generation anew. How on earth did such a plant evolve to become one of the major agricultural grains worldwide? The answer of course is selective breeding of an ancestral grain by early farmers, a subject that archaeologist Michael Blake of the University of British Columbia has studied for many years. The farmers in question were the ancient inhabitants of the Balsas River region, in what are today the Mexican states of Guerrero and Michoacán, and the grain that these farmers cultivated, which still can be found there today, is called teosinte (Zea mays ssp. Pariglumis). Superﬁcially, a stalk of teosinte looks like a stalk of maize, but rather than having kernel-rich cobs wrapped in husks, an “ear” of teosinte consists of a cluster of spiky leaves each enclosing a row of small, loosely held seeds which, when ripe, are free to fall to the ground and disperse. Sometime around 9,000 years ago, according to the latest evidence, early Balsas River farmers must have begun to select teosinte seeds for replanting, consciously or unconsciously favoring those with the largest and most abundant seeds, those which germinated quickly and ripened simultaneously, and those which were retained on the stalk most ﬁrmly so that they could be harvested rather than dispersing in the wind. 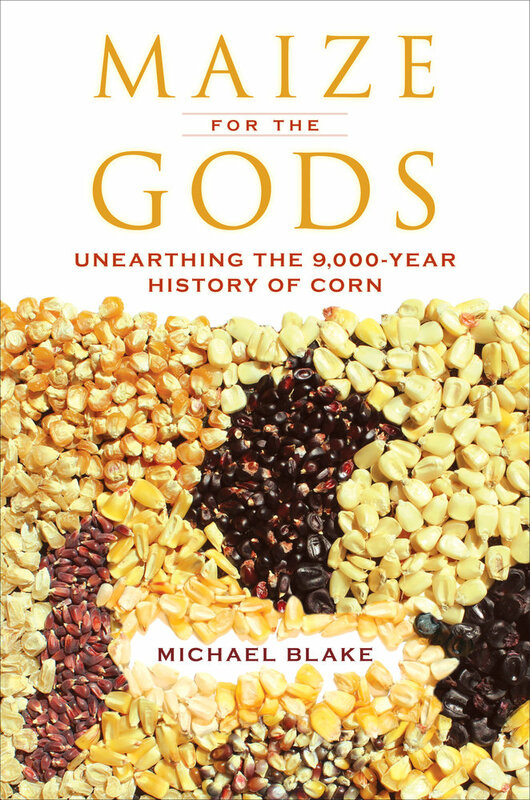 By about 6,000 years ago, the date of the ﬁrst recognizable cobs found in a cave in Oaxaca, maize was well on its way to becoming the grain familiar to modern consumers. From central Mexico, maize cultivation spread south through the Andes to Argentina, and north through the desert Southwest to the Great Lakes. Today it is grown globally for both human and animal consumption, and lately for ethanol fuel, in greater quantities than either wheat or rice. In Blake’s narrative, the story of teosinte’s transformation is revealed through a tangled tassel of archaeological strands. Some of the evidence is easily recognizable, in the form of discarded cobs or kernels preserved in dry caves, sherds of pottery used for cooking, or art and myth of indigenous peoples. But much of the latest research relies on high-tech analysis. DNA sequencing has made it possible to construct detailed family trees of various varieties of maize, right back to the original teosinte ancestors. Microscopic studies of pollen grains reveal patterns of cultivation even when macroscopic remains no longer exist. Accelerator mass spectroscopy, a technique that teases out the pattern of chemical elements in vanishingly small samples, has made it possible to pin down the dates and origins of artifacts that were previously inaccessible to archaeologists. My recommendation: make yourself a nice bowl of popcorn and settle down with Blake’s book for a story as remarkable as the snack you are enjoying.